Do you have a little one that you want to keep entertained even when they aren’t playing by themselves? 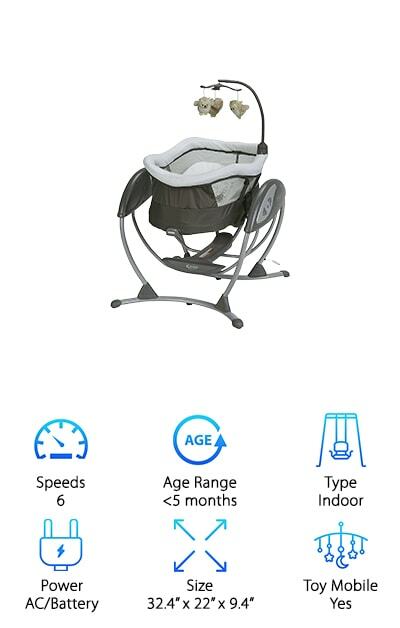 Well, then you’re going to want to look at the best baby swing for sale. These swings help your baby stay comfortable and happy while also keeping them somewhere safe. Each of these swings has different features and that means you’re going to want to look through the entire baby swing buying guide to find out more. Speeds: Baby swings generally have different speeds that you can set up to help your baby feel more comfortable. You’ll want to look at the different speed options to make the best choice for your needs. Age Range: Different swings are made for different age children and you want to make sure you’re getting something that is made for your child specifically. That way they’ll be safer and enjoy the swing more. Type: Some swings are designed for indoor use while others are used outdoors. You’ll want to think about what you’re going to use the swing for and then look at the different options for that purpose. Power: There are different types of swings in regards to how they are powered as well. For example, some will be manual, meaning that you have to push them, and some will be battery operated instead. Size: Pay attention to the overall size of the swing in question so you know if you have enough space for it in your home. You want to make sure it’s large (or small) enough for your child as well. 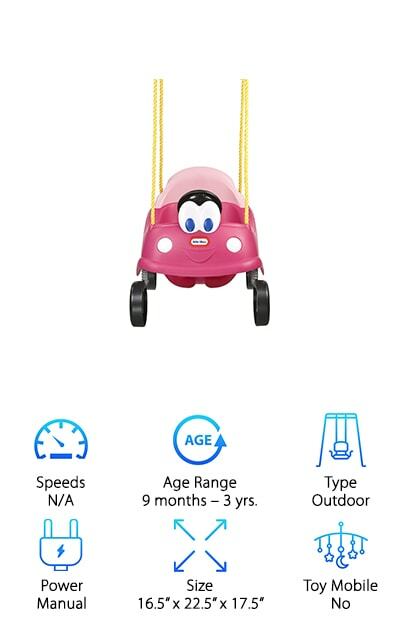 Toy Mobile: Some swings have mobiles as well, making sure that your child always has something to play with while they’re in it. They may have different types or quantities of toys depending on the age of the child. Putting your little one in a swing can be a super fun activity for them and a way for you to get a moment just to yourself. With the right swing, you can enjoy yourself and so can they, which is definitely an important aspect for anyone. That’s why we’ve gone through some of the best options we can find and created these baby swing reviews. All you have to do is find the best baby swing reviews out of our options. Our top pick is the Fisher-Price My Little Snugabear, which comes in three different color/style options so you can get something your little one is definitely going to love. Designed in a teepee style, it even has a mobile above to keep your little one entertained while they swing (and maybe even help them fall asleep). 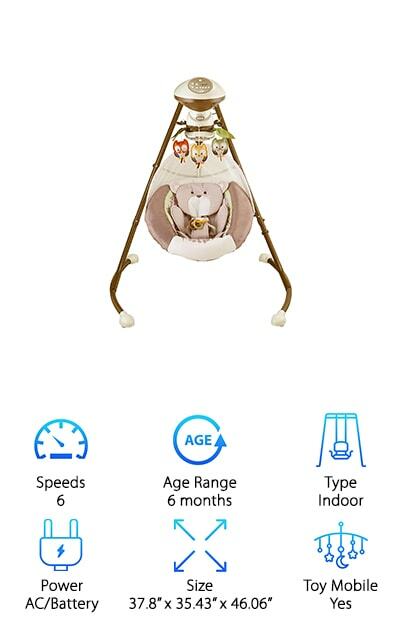 It has 6 different swing speeds as well as 2 different swing motions that you can mix and match along with 16 different songs and soothing sounds from nature as the best electric baby swing. On top of that, there are 2 different recline positions and 3 adjustable seat positions. The mobile above their head includes a mirrored globe that will definitely keep their attention too. Just program the swing to the settings you want and it will start all on its own. It even runs on AC power or battery power, based on your personal preference (or needs) at the time. 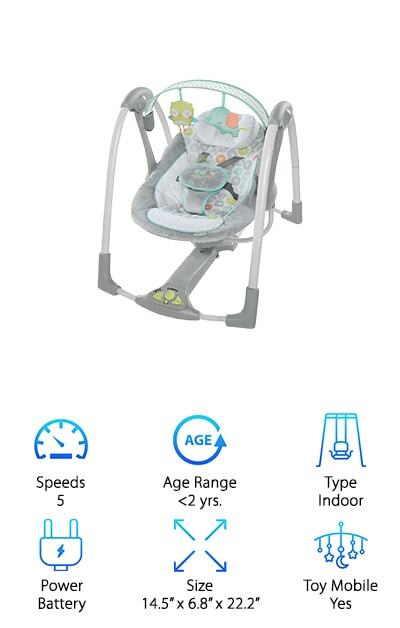 Our best affordable baby swing is the Graco Simple Sway Swing, which comes in 2 different colors that are designed to make your little one feel great and really enjoy their time in it. It’s also small enough that it fits just about anywhere in your home or can even be taken with you when you travel, making it the best small baby swing. 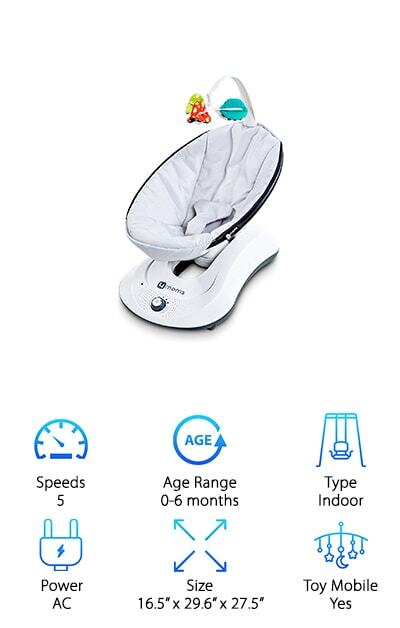 The swing itself moves slowly from side to side and has 2 different speeds of vibration and 6 regular speeds that will help your baby to rest and sleep. There’s a deep seat with plenty of cushion and even a plush headrest that will help them relax. When it comes time to clean you can easily wipe it down and the headrest can even be taken off. Use the system with AC power or with battery power so you can get more versatility and take it with you or use it at home in different ways. There are even 10 different songs and 5 different nature sounds to choose from while in use. The 4moms RockaRoo is actually a super small profile swing that will still give your child the comfort and relaxation that they might need to sleep. It’s definitely the best portable baby swing. It’s available in 2 different colors and offers 5 different speeds as well as front to back gliding motions. Able to run on AC power, you can save money on batteries and still plug it in anywhere that you happen to go. The speeds are simple to adjust because there’s only one dial at the base of the unit and there’s an MP3 plug in so you can play any music or sounds you want. The material portions of the swing are machine washable, so you can easily clean up any spills or messes. Designed for children 0-6 months of age, it is lightweight and you’ll have no problem taking it with you anywhere that you want to go as a result. The Fisher-Price Snugapuppy Swing is small (though not quite as small as the last option we talked about) and provides you with several great options, including being the best baby swing for small spaces. 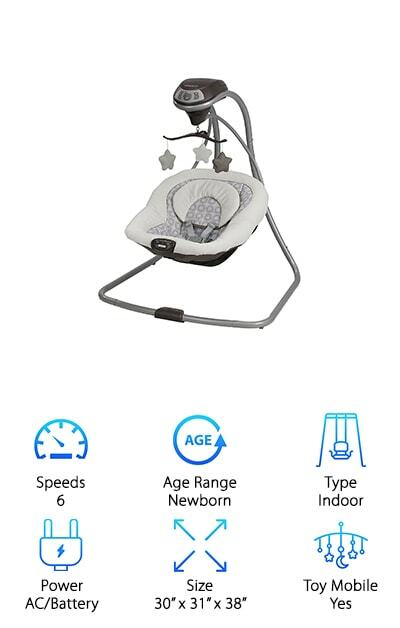 It swings in one of two different directions, offers two different recline positions and has 6 different swing speeds and 16 different songs and sounds to choose from. You can easily move it around to different positions because you just push the button and turn it where you want it. The plush seat pad has a body insert and head support and all of the pieces are machine washable in case you end up with a mess. Your little one will be more than happy with the mobile and mirrored globe above their head and you’ll love that it can be plugged into the wall or run on battery power. Easy to assemble, your little one could be enjoying this swing in no time at all. This Little Tikes Princess Cozy Swing is the perfect way to take your little one outside to have some fun and some fresh air. It’s definitely the best cheap baby swing for outdoors. It looks just like the little pink car you can get from the same company and can easily be attached to your current swing set. 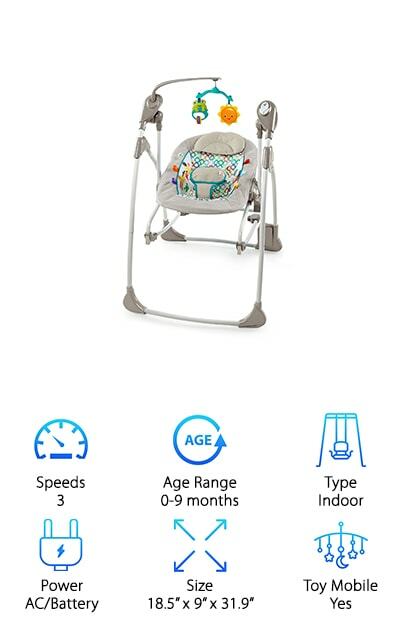 The max weight of 50 pounds means that even your little bit larger children can use this and there’s a seat belt to keep them safely in the swing while it’s in use. The steering wheel and horn make it even more fun for your little one because they’ll feel just like they’re driving a car. The setup process is super easy and before you know it you’ll have your child swinging and loving it. It looks fun and it’s definitely going to be fun too. Ideal for children 9 months to 3 years, it has a high seat back to improve protection and is made with a heavy duty molded plastic. The Graco DreamGlider Sleeper is actually a unique design because it looks like a bassinet, but it provides all of the features of a swing as well, which makes it the best baby swing for sleeping. Your little one will get the rocking motion of your favorite glider or one of two different vibration speeds. You can also choose from 6 different gliding speeds and 10 different songs or 5 different sounds that will definitely keep them entertained or help them drift off to sleep. The 3 point harness makes sure that they are safe and secure whether you’re using this in a more upright design as a swing or laying down as a glider. When you want to switch from one to the other you just pull the lever and it moves just like that. Even better, you can use it with AC power or battery power. There’s even a toy mobile above their head to keep them entertained and focused while they’re rocking and a timer mode to save power. The Creative Playthings Infant Swing is simple, but you know the saying ‘if it’s not broke, don’t fix it.’ The style of this swing is great for comfort and for security. It attaches to your current swingset with no problem and uses short ropes to secure it. All you have to do is put it up and it’s ready to go. There’s a seat belt already attached so you can buckle your little one in and start playing right away. There is also an extended back and a restraining bar in the front that keeps them even more secure. Toddlers are definitely going to have a lot of fun with this swing and even smaller children may be able to enjoy it if they are able to comfortably sit on their own. It’s made so you can put your little one in and take them back out easily with the bar folding down or you can slide them in through the top. The Bright Starts Rock and Swing is actually a 2-in-1 system that also comes in 1 of 2 different styles. You can use the unit as a swing by hooking it up to the entire frame system or you can remove the rocker off the swing frame and you’ll be able to use it as a rocking seat instead. That means even more comfort and fun for your little one. It’s the best compact baby swing here with the blanket style back provides several ‘tags’ that your little one can play with and even chew on and the mobile above definitely gives them something to look at. There’s weight sensing technology inside the seat which means that even as your child gets bigger they still get the same speed they love. You’ll also get an auto shut-off timer for 30, 45 or 60 minutes. Super quiet and easy to fold up, it offers 3 recline options and a 5 point harness. 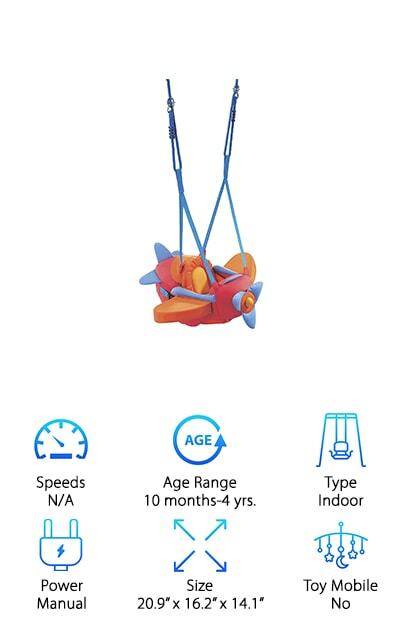 The HABA Aircraft Swing makes your little one feel just like an airline pilot (even if they don’t know what that is yet).It’s super soft and designed to be used indoors but it gives them the fun of any outdoor swing as well. Designed for children between 10 months and 4 years, this swing is made with polyester, which means it can be washed easily if you ever end up with a mess. The seat and straps are adjustable and grow with your child while the design makes it super easy to use. You can hang this swing just about anywhere you want you can definitely enjoy playing with your little one and showing them all the fun of the new toy. 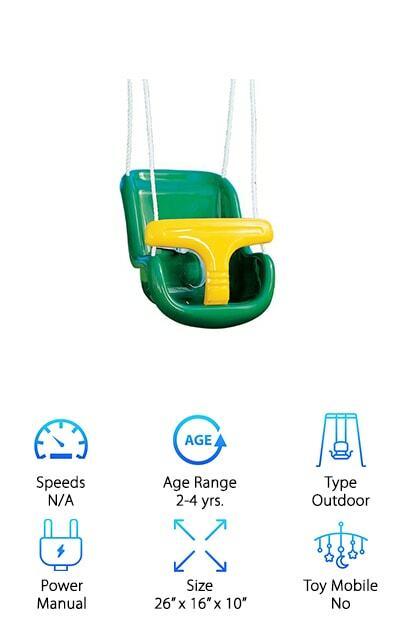 They should always be supervised with this swing but they’ll also have plenty of safety features and can enjoy jumping and playing around whenever they want. The Swing ‘n Go Baby Swing from Ingenuity offers a super cute design on a low profile unit. It’s slim when folded and you can easily carry it with you entirely one handed, which makes it easier to transport. 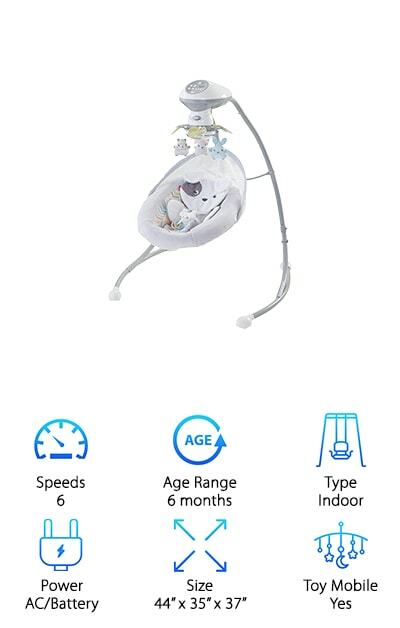 It offers 5 different swing speeds, 8 different songs and 3 different nature sounds so you can find something that your little one is really going to like. Even better, it’s practically silent when it operates, so it helps lull your baby into comfort. There’s an auto shut-off timer that you can program to 30, 45 or 60 minutes and there are even different volume options to make sure the sounds aren’t too loud for your baby. If you ever end up with a mess the seat pad and head support are easy to wipe down and the whole thing runs on batteries so you don’t need to worry about power wherever you go.